Hey guys! 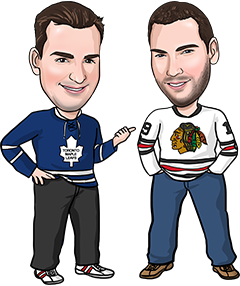 It’s great to be back writing up some NHL betting tips! That all-star break felt like it lasted forever. Gotta admit, this was the first year in a while that we actually paid a lot of attention to the all-star game. The 3-on-3 was a hit and there was a lot more intensity this year with the new format. And we even won our only bet on the all-star game, cashing with the Atlantic Division +115 in the semifinal (we tweeted that one out). John Scott as MVP surprised a lot of people, but it probably shouldn’t have. Oddsmakers smelled that one from a mile away, making him the favourite on the MVP betting odds. When he scored his first one, we thought that might have been a little scripted, but that second goal was a snipe. Anyway, back to the grind tonight with 12 games on the slate. Just like we were a little cautious before the all-star break with worries about players looking ahead, betting the first games after the break are a little dicey too because you never know how players will respond to nearly a week off. But we’ve identified 3 games tonight where we think there’s good value, and we’ll fire away. Neither of these teams were happy to see the all-star break come. San Jose had earned points in 10 straight games, while the Ducks had won 5 of 6 and were 10-3-2 in their last 15 games. Of these 2 teams, we like the way Anaheim’s been playing a lot more. The Sharks’ recent record might be a bit misleading because they’ve fattened up on some weaker teams (Leafs, Flames, Jets, Oilers…) but the Ducks are absolutely legit. They’ve outshot their opponent in 14 straight games and appear to be the team we’ve been used to seeing over the last few years, not the team that sucked in the first couple of months. The home team has dominated this California rivalry over the years, going 15-4 in the last 19 meetings. We expect the Ducks to come out hungrier of the two teams tonight on their home ice and to get the job done. When you consider how good the Rangers are at home (18-5-2), they might be the worst road team in the NHL. New York is 3-10-2 in its last 15 away from MSG, and just 9-12-1 overall. So why are we on the Rangers as a road favourite tonight? Well, New Jersey isn’t exactly a road game for NYR. There’s always a lot of Rangers fans that go across the river for these games, and New York has won 4 straight in NJ and 6 of the last 7 meetings. Lundqvist is rested from the all-star break, which should also help the Rangers a lot. We were on the Devils for a recent Best Bet winner against Ottawa, when New Jersey led 5-0 after the first period. But that was a bad spot for the Senators, not necessarily a dominant effort by the Devils. Including that game, New Jersey has been outshot in 5 straight games and 9 of their last 10. They’re also without Cammalleri again, and should be bigger underdogs tonight than they are. There might not have been a more misleading result in the NHL this year than Minnesota’s 2-1 loss to Arizona last Tuesday. The Wild outshot the Coyotes 24-6 in the first two periods but couldn’t protect a late 1-0 lead, falling 2-1 in a shootout. Minnesota had been struggling but that game, and the 2 before it (a 3-0 win in LA and a 4-3 loss in San Jose), indicated to us that they’re coming out of that slump. They’re currently 1 point out of a playoff spot and should have some desperation in their game tonight. The odds also tell us something about this game. New York is 15-8-2-1 at home this year and has a better overall record than Minnesota, yet the odds are basically even. That suggests the oddsmakers are expecting a Wild victory tonight, and so are we.